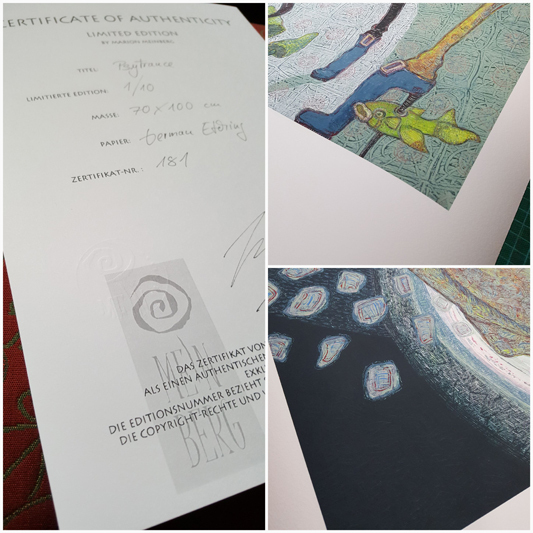 Limited editions (with certificate) are accompanied by titel, signed and numbered. The signature and edition number verify the print as an authentic work of art. The prints are additionally stamped on the certificate with a relief. The total edition number is final, and once sold out no more will be made or sold. The image is professionally printed on “Hanemühle German Etching Paper” for best color reproduction: 350 g/qm, acid-free, 100% cotton, paper natural. The image is printed with white border. The print is carefully inspected before final dispatching – carefully packed and shipped in a double mailing tube. Prints are send unframed. For shipping I charge additional fees (packaging + shipping 12 €). The image will be sent rolled and with a shipping number, which I send first to you. Please have a look at the pictures. You will find there the editions and prices. Please do not hestitate to contact me, if you have further questions. With pleasure I will send you a foto of the image in relation to the paper format by e-mail. Large sizes on > AluDibond < are also limited: Limited Editions of 1 – 5 in each edition (depending on size). Pictures on AluDibond, show the picture without a white border and are ready to hang. By interest, please contact me. My pictures are scanned with a Cruse High-Performance Scanner 1:1 for optimal art print. The original table with the image, moves under the light bar, which achieves a maximum sharpness and exact parallelism. The surface textures and colors will be reproduced perfectly with maximum sharpness! Art prints can be printed up to 30% larger than the original even more precisely.